Hotel Park Villa, Vienna. Park Villa Hotel Vienna. 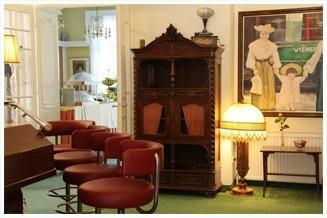 Four-star Hotel Park-Villa is a typically Viennese hotel, located in Döbling, Vienna’s finest residential area. This small boutique hotel’s home is a lovely renovated art nouveau mansion built in 1888. The hotel enjoys a peaceful location in Vienna’s 19th district, next door to two large parks. It is also close to the Grinzing and Kahlenberg traditional wine taverns. Vienna city centre is only 15 minutes away by bus. The nearest metro station (U6 Nussdorfer Strasse) is a five-minute walk from the hotel. All of the hotel’s 21 rooms offer modern four-star comfort. Most of the rooms have balconies and WiFi is available free of charge in all rooms and in the garden. A rich buffet breakfast, afternoon tea, coffee and cake are served in our salon. When the weather is fine, we serve breakfast in the garden. Parking is available just 250 meters from the hotel.